I am totally feeling the love this week from my blogger friends. This is my second award in one week. 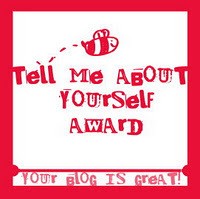 I received this award from A Mommy’s Lifestyle. Please check out her site. Lindsay’s site is full of food, fashion and shopping. Here's how it works...in order to "claim" the award, I have to do a few things. Please check out these great blogs. I love being a mom too! Thank you so much for the award! will do the posting now! Thanks so much for coming by Mommy LaDy Club and for your lovely comment:) I do like to bake from scratch when it is finished, and it turns out, but the initial thought always scares me. I know what you mean. Sometimes the directions look like its more difficult that what it really is.